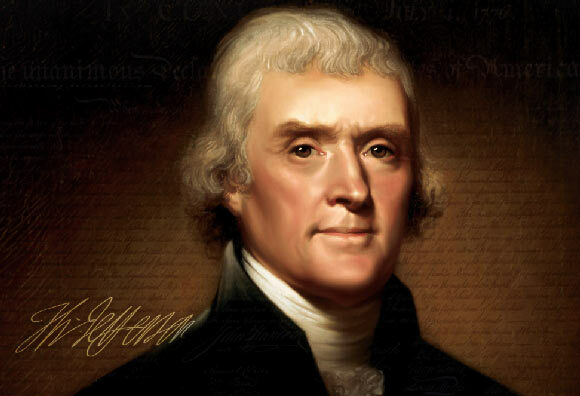 Thomas Jefferson was the third President of the United States, and the one responsible for drafting the American Declaration of Independence. He was also a prominent inventor of his time. Jefferson was born into an elite farming family of Virginia in 1743, and did not start his formal education until the age of nine. He learnt Greek, classical languages, literature and mathematics at a private school. In 1760, he went to Williamsburg to attend the College of William and Mary. Disappointed with the education standards there, he sought the company of older scholars who taught him more than his academic pursuits did. Jefferson studied law under the guidance of one of his college companions, a lawyer named George Wythe. His rigorous training lasted five years, and Jefferson was inducted into the Virginia Bar in 1767 as one of the most learned lawyers in America. His foray into politics coincided with changes in the sentiments of Great Britain’s American colonies. There was unrest and dissatisfaction regarding the heavy taxes being levied on the colonies, and Jefferson was one of the earliest supporters of American independence from Britain. In 1775 he was commissioned by the Congress to draft the most famous document in American History, the “Declaration of Independence“. After America gained independence in 1776, a movement to which Jefferson was monumental, he served as the Governor of Virginia, Minister to France, Secretary of State during George Washington’s presidency, Vice President during John Adam’s presidency and after that, was himself elected as the third president of the United States. After the tragic death of his wife, whom he was devoted to, Jefferson is strongly believed to have had a relationship with his salve Sally Hemings, and to have fathered her six children. His contributions as an inventor are diverse. Thomas Jefferson was keenly interested in farming; he wanted to invent a plow which that would dig deeper than the wooden ones being used at that time and simultaneously prevent the persistent problem of soil erosion. He invented an iron plow in collaboration with his son in law Thomas Mann Randolph, and used mathematical formulas and labeled diagrams to document and enable ease of reproduction. Another of his inventions includes the “macaroni machine” – a device used to roll pasta. After his travels to Europe, Jefferson brought back a French chef with him. He was interested in fine wines and cuisine, and often served exotic food at his parties. One of his most famous contributions is towards the development of the Polygraph. This was a machine used to copy letters by imitating the movements of the writer’s hand. It was originally invented by the Englishman John Isaac Hawkins, who later sold the rights to produce and market it to Charles Willson Peale. Jefferson purchased many versions of the Polygraph from Peale, several of which were developed after recommendations for improvements by Jefferson himself. Another one of his inventions includes the “Wheel Cipher” which consisted of twenty six inscribed cylindrical wooden pieces threaded together into an iron spindle. The pieces with the letters could be rearranged to send coded messages. Other inventions include a Great Clock, that told the time and day with the use of a long, heavy chain that extended to the floor. This clock was hung at Jefferson’s plantation, Monticello. The interior of the clock faced towards the hall whereas the exterior (containing the hour hand) faced the plantation, for the benefit of his workers. The clock had a massive gong, which was loud enough to be heard three miles away. Another one of his inventions was mechanical “dumb waiters” placed near the fireplace, through which servants could easily send wine from the cellar. It is likely that Jefferson modeled his device on the basis of the one he saw at a cafe in Paris. Other notable mentions are portable copying press, automatic double doors and a revolving, adjustable book stand. Thomas Jefferson commented on his love for science, saying “Nature intended me for the tranquil pursuits of science, by rendering them my supreme delight”. He died at Monticello at the age of 83 on July 4th, 1825 – the day of the 50th anniversary of the American Declaration of Independence.